Edwige Renée Dro is a writer from Côte d’Ivoire. 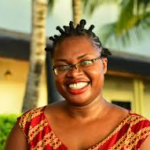 Also a translator and a literary activist, she is the co-founder of Abidjan Lit, a Collectif of literature lovers seeking to take over Abidjan with literature. Renée’s writings have been published in various magazines like Prufrock, Popula or This is Africa. She is currently writing a biographic novel of Marie Séry Koré, one of the amazons who marched against the colonizers in Côte d’Ivoire in 1949. The book is as yet title-less.